The kids are officially on spring break. The first couple days of their break weren't very spring-like. But yesterday, the sun came out and the temp got up to maybe 50 degrees and folks, that's spring break, get outside, maybe even wear shorts, life is good weather to us. Sure the sign said frozen, but that didn't bother us. The cold never bothered us anyway (sorry it had to be said). Lucy looks sort of rock n'roll to me here--riding her brother's old red trick bike. The weather made everyone happy, look how smiley Tim is. Don't worry, even thought some of us might have worn shorts yesterday, we totally know it's too cold for the pool. We just never put it away from last summer because we are classy like that. 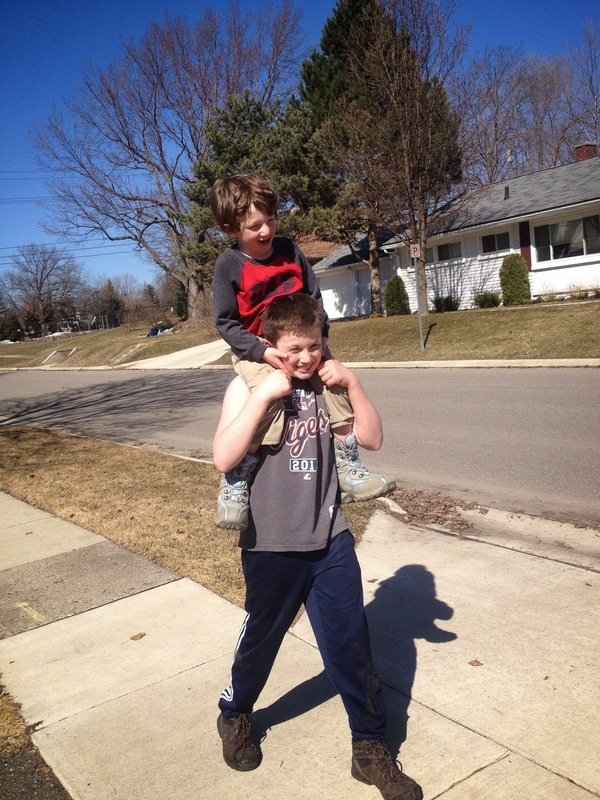 It's strange to see your youngest child ride on your oldest child's shoulders. After I took this picture, I followed closely behind them spotting them like they were gymnasts. We have no real plans or super high expectations. We hope for more sunny, 50-degree days and maybe a trip (or two) to Dairy Queen. In other news, like real news, like legit newspaper-y news, I was in the Detroit Free Press. I mean the show I'm co-producing Listen To Your Mother Metro Detroit was featured. A very nice preview of the show was in THE Sunday paper. Woot. Woot. Click here to read it. Yay Spring and yay LTYM publicity! Um....I don't think I could ever live in a place that employs "frozen payground surface" signs. Ha! Even if the playground does, in fact, freeze sometimes, if you have to actually make signs....Of course, I don't really leave the house much in the winter, so, I wouldn't even know if we had those or not. SNORT. Look at you in the news! Love your sunshine-y pics!